Drogues & sea anchors in storms. Do you need one? Dongfeng’s triumph in Volvo is amazing. This is why. Thinking about a wooden sailboat? Wanna new beautiful sails? Maybe for free? Lizbeth from S/V Delos is back with her own ship! It would be very inaccurate to introduce him as a retired man despite his age. He is going to spend his 80th birthday somewhere in the southern ocean. Before we proceed to his current amazing attempt (started 21st May 2018), see this man’s life story. It is TOO GOOD to be featured in some Hollywood movie. This Swedish small boat builder, sailor and writer is no amateur who went crazy. It is his tenth self-designed and built boat. Since he first sailed the Atlantic on a converted steamboat, he started to build small but secure boats. At his website www.yrvind.com, you can find many interesting stories and blogs, where Yrvind is pointing out advantages of small boats. After his first voyage, he began to design and construct a small boat for ocean sailing in his mother’s backyard. To get shelter from the weather I put up some tarpaulins between the apple trees. It did not take long before the city planner was there asking me if I had permission. “I shall only build a small boat, then I take down the tarpaulins and go sailing” I answered. “Have you been thinking about what would happen if everyone did like you?” He asked. “What would happen if everyone was a town planner” I said. That made him indignant. He forced me to take down the tarpaulins. In the evening when mother came home and heard about it she got mad. For the whole story read here. You will definitely love his attitude and sense of humour. Often he becomes very poetic when speaking about sea. You can see a true sailor’s soul there. You’ve read correctly, 19ft. Just one metre beam creates the space for Sven Yrvind on his boat called Exlex. The thing we love most is that it looks like madness but Yrvinds arguments sound pretty solid and it’s not just a theory. He sailed most of the oceans on similarly sized ships. Now he wants to check the boats longterm security in conditions of the rough seas. The (in)famously known 40’ latitudes are looking as a proper environment. Actually, at the finish he will be approaching Furious Fifties borders :-). Check Windy.com or some global weather projection app to see what we are talking about. You can look at those parts of world anytime, while reading this article, there are always “roaring” winds! Sven Yrvind is an experienced boat builder. He is saying that his chances are “good, 50:50” but that statement seems like proper attitude of a man, who considers risks and dangers. In this video you can see how Sven tested his boat for failure conditions. When he built his first boat as a young man and put it on water, it has not ended well. Weight proportions were terrible and many leaks stopped him after LaManche crossing. Next time he put her on water after the refit, there was no moisture in the boat. Since then many years went by and Yrvind sailed thousands of miles in his own small vessels. He claims in his manifesto that this is not a record attempt nor a protest. It’s an experiment. 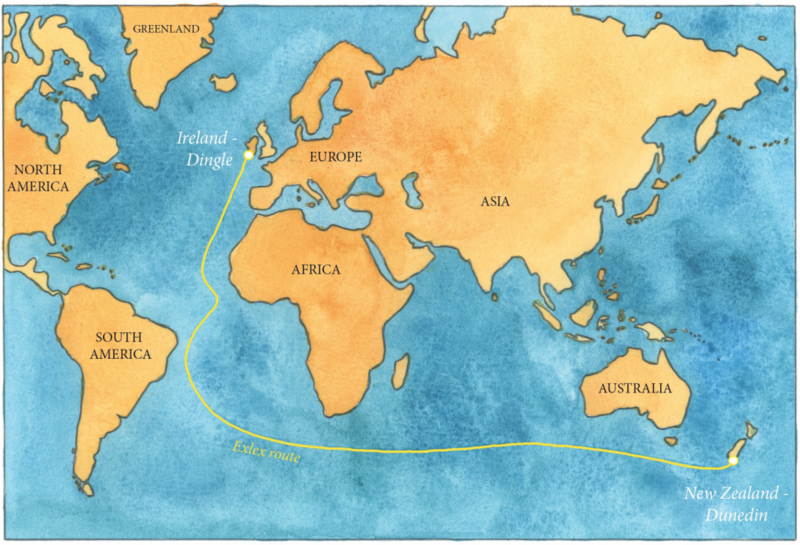 The plan is to make Exlex sail from Ireland to New Zealand within 300 days. The projects is maintained by donations so there is still time for you to contribute via his website! There is tracker available for checking his current position. Progress is updated by Sailing reports, of which there will be more in the future. The voyage started on 21st May, first report was published on 4th June with updates about initial problems with electrical system that have been solved. The sailor feels positive, sees many fishing ships and is tracking them by AIS. The true adventure will probably come in several weeks when Exlex reaches southern waters. More to be come when Yrvind thinks it’s worth reporting something. Check out how to prepare food rations for 360 days on a small boat. Tesla Powerwall on your boat. Revolution or a bad idea?